A client is having a tough time tracing down a static electricity problem, so I built one of these little electroscopes designed by Alan Yates (@vk2zay). Premade boards are available here from the wonderful Osh Park, and here a link to the electroscope parts list. 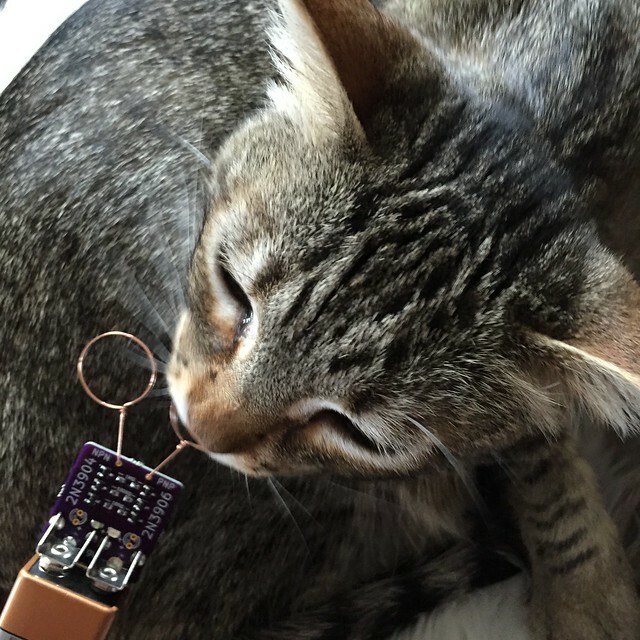 Here's Alan showing how it works with a DIY electret. An electroscope measures electric fields or their change. This design is a fairly simple circuit: three cascaded amplifiers formed by simple bipolar transistors. Each transistor stage has a gain of (I'm guessing) about a hundred, so the cascaded combination should have a gain somewhere around a million. So this is easily sensitive enough to detect the changing electric fields of someone walking by. Here I've rubbed some electrons off my cat (cat fur is high on the positive side of the triboelectric series). As I bring the electroscope towards her, the orange positive led lights. 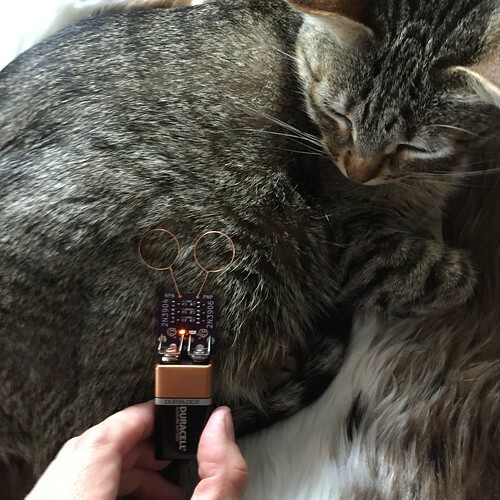 Here's a demonstration with a glass rod: I've stolen some electrons from my cat, so the rod is negatively charged. As I bring it towards the electroscope the green negative LED lights as the electric field becomes more negative; as I withdraw it it the orange positive LED lights as the field becomes more positive.